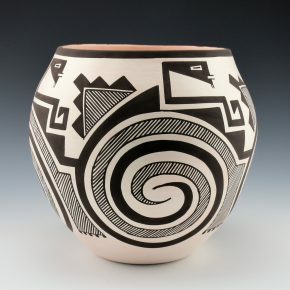 Laguna Pottery of Laguna Pueblo, English Pronunciation: "Lah-goon-ah " Traditional Name: Ka'waika. 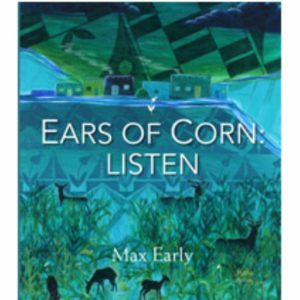 It is the largest Keresan speaking Pueblo, with around eight thousand members. They prize thinking above all human attributes, consequently they value intellectual activity and education. 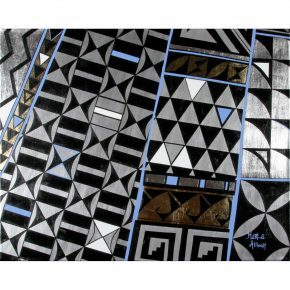 A scholarship program is conducted by the Pueblo, thus insuring advanced study for many of the young people, making them among the best educated of all Pueblos. Laguna Pueblo comprises six major villages, Laguna, Paguate, Encinal, Mesita, Seama, Paraje, scattered over many acres with the political center at Laguna. 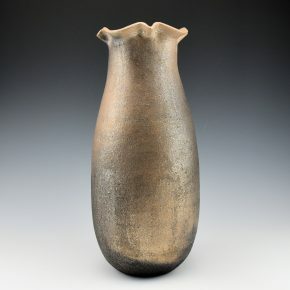 In the 1970's, the traditional craft of pottery making was re-established. 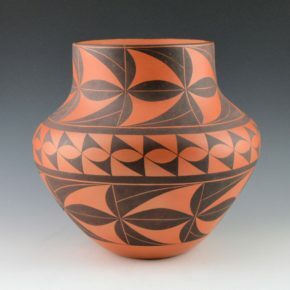 Fine work in red, yellow and orange geometric designs, similar to Acoma work, was created by a number of artists. 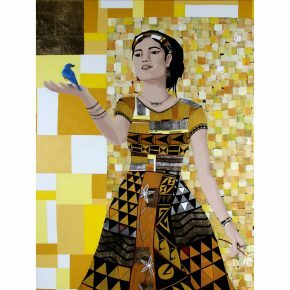 Painters and jewelry makers have begun to work again in the ancient crafts, but they are bringing a modern note in the innovative designs and techniques which set their work apart from many other Indian craftsmen. The feast of St. Joseph, celebrated on March 19th and on September 19th. 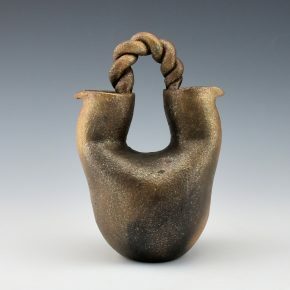 Yvonne Lucas learned to make pottery from her husband, Steve Lucas and his aunt, Dextra Qutoskuyva. 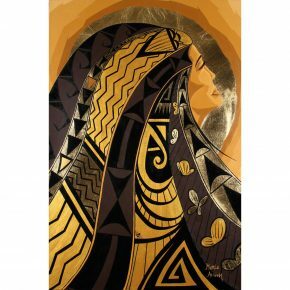 She is one of the few Laguna potters who use all traditional materials and traditionally fires their pottery. 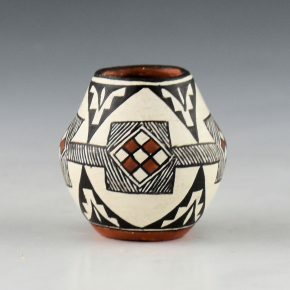 The jar is slipped with a white clay and then painted with a red clay slip and bee-weed (for the black). 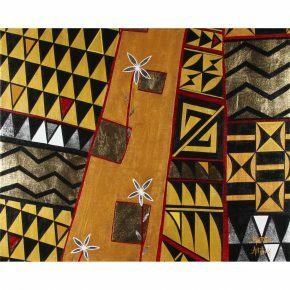 The design has a leaf pattern around the neck and in the central diamond-shaped medallions. Separating the medallions are rainbow bands which are polished red. 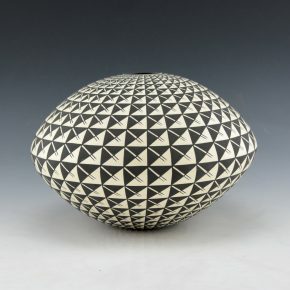 The designs are a striking flow of round and linear patterns. The contrast of the red and black on the white works perfectly for this size. 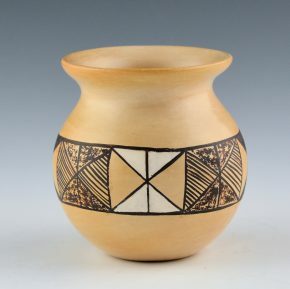 The jar is traditionally fired outdoors, so there are blushes on the surface creating the slightly tan areas. The jar is thin-walled and perfectly shaped. 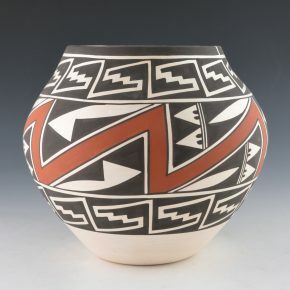 Yvonne focuses on the black-on-red coloration, as that was a style seen at Laguna Pueblo around 1900. 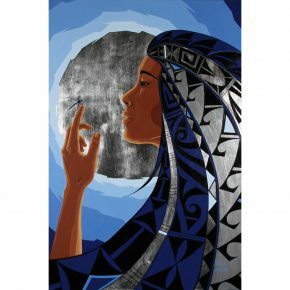 This is Yvonne’s way of paying tribute to these pieces but also giving it her own modern style. The jar is signed on the bottom in the clay. 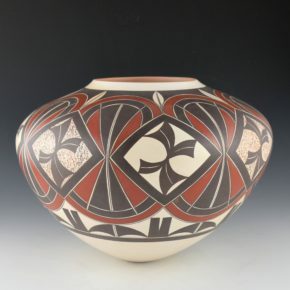 Calvin Analla learned to make pottery from his sister, Yvonne Lucas and her husband, Steve Lucas. 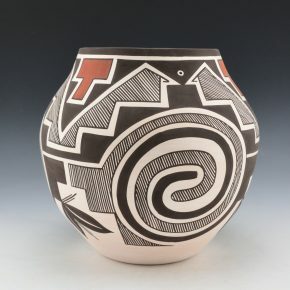 This large water jar is thin walled and made with the traditional red clay from Laguna Pueblo. The jar is painted with bee-weed, into which he has mixed some mica. The mica makes reflections in the clay. 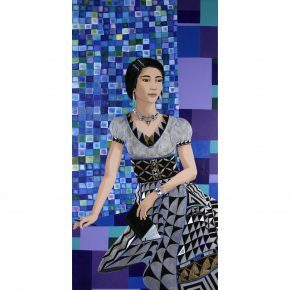 Calvin is known for his very delicately painted designs. 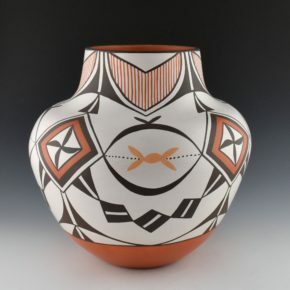 This jar has cloud designs above the shoulder and plant designs below. 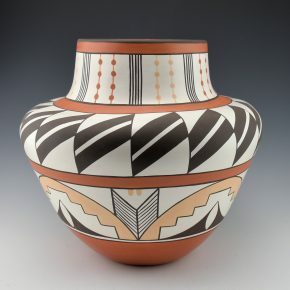 The thin lines painted with the bee-weed show create a striking contrast with the red clay. It is signed on the bottom.